Unique employment opportunities are now available to help establish a brand new Australian Government agency whose purpose is to support regional communities and help build resilience for the future. Of all the benefits to working in the Australian Government – money, stability, learning and development, career opportunities – being part of a “start up” government agency isn’t usually one of them. In fact, one of the facts of working for the government is that (normally) no matter where you go or what position you apply for, you will always be stepping into a team with an established culture – complete with existing hierarchies and well-established practices. The Regional Investment Corporation (RIC) is different. A brand new agency – whose purpose is built around helping regional communities grow and prosper – the RIC is building its workforce from the ground up. 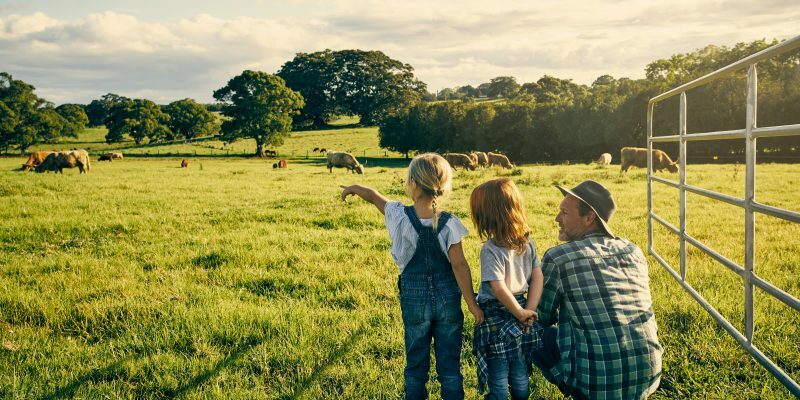 Agriculture provides the backbone for many of our rural and regional communities and farming has a special place in the hearts of many Australians. You only need to walk into your local supermarket, pub or post office to see how the current drought has galvanized us – there are numerous appeals, fundraisers and donations underway. Managing through drought, and other events outside their control is what our farmers are programmed to do. And they do it well. They’re the driving force behind a $60 billion agriculture industry and their inventiveness and problem solving skills play an important part in keeping regional communities strong. What the RIC does is give them the finance they need to realise those new ideas that are often born during times of hardship. The Regional Investment Corporation (RIC) is a brand new government agency that delivers low interest finance to farm businesses in need. Their loans offer farmers financial relief and the chance to improve their farm business situation at the same time. It also provide loans to state and territory governments for large ‘shovel ready’ water infrastructure projects like dams, weirs, pipelines and waste water treatment facilities. The RIC’s headquarters are being set up in Orange NSW, a scenic town located just past the Blue Mountains about 3.5 hours’ drive to Sydney and 3 hours’ drive to Canberra. Those lucky enough to secure a position in the inaugural team will play a vital role in shaping the agency’s culture and ethos, and be instrumental in helping to administer services for farmers and the agricultural community. David Foster, Chair of the Board of the RIC, says that a major immediate focus of the agency is to establish the brand, educate networks, and help build awareness of what they do and the support they provide. “(The RIC) will be a very customer-focussed workplace. We will be helping producers when they need assistance, and then helping them set up for the future. We will also be working proactively to ensure that producers are aware of the RIC and how we can support them and their business. 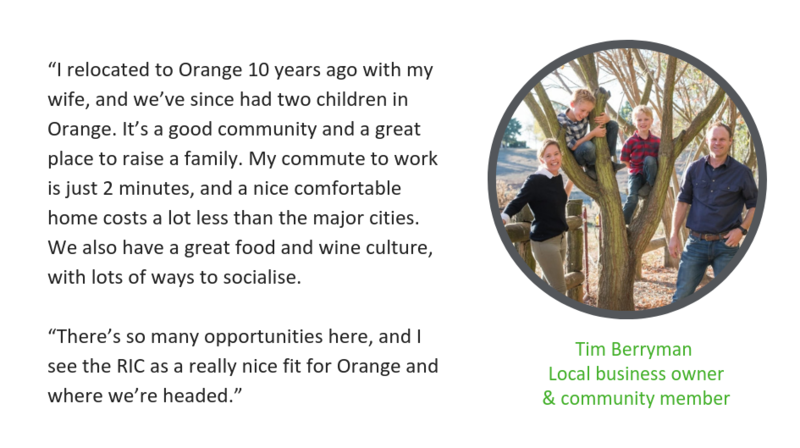 As a coveted location for a “tree change”, Orange is used to welcoming new residents keen to leave the grind of city life. Tim Berryman, local business owner and community member, says “We have some huge employers here, including state and federal government agencies, professional services, a vibrant finance sector, and many other organisations focussed on agriculture, such as Paraway Pastoral, Macquarie Bank’s agricultural arm. “The town is really progressing, driven by interest from big city markets. We also have some incredible facilities including a brand new hospital and private hospital, quality public and private schools, and excellent universities. “An organisation like the RIC fits nicely with the town, and will attract some definite talent from the Sydney and Canberra markets who are keen to leave the hustle and bustle of the city. There are multiple opportunities available to build the initial team for the Orange headquarters. The RIC is seeking specialists who can adapt, think on their feet, and take initiative. You will be responsible for spearheading the development of your own area, and collaborating with others in the inaugural team to develop and promote the internal culture and external services. This is unlike most other government roles and may require you to wear different hats and get your hands dirty as you help shape the formation and establishment of this brand new agency. HorizonOne Recruitment at the EAN Conference!